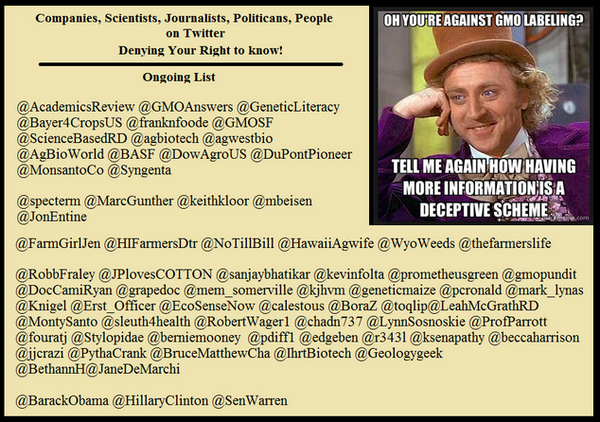 Recently, I found myself included in a who’s who of GMO Right-to-Know deniers. Now that is a list of some smart people, and I’m glad I’m on it — even if I am an idiot. The meme states that pro-GMO folks (a misnomer — we’re pro-evidence) believe that having more information is deceptive. An assertion that is both wrong and right. (As a small clarification, Mark Lynas and Julie Kay, aka sleuth4health are both pro-labelling, therefore, are wrongly included on this list. Mark Lynas made a speech on the necessity of labels for GMOs, and Julee K did a blog post endorsing a particular method of labelling.) That digression aside, let’s dissect the meme. Who then is being deceptive? As they will tell their followers point-blank (as the quotes in the footnote show), the label is intended to scare people away. It has never been intended to be about anyone’s Right to Know, only their Right to Mislead. 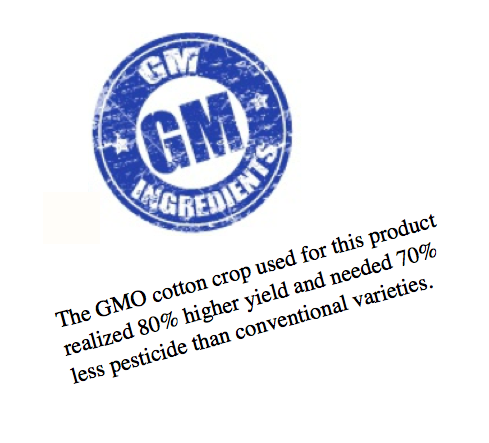 To see why, let’s take Julee K’s endorsement of an informative GM label (picture below — ignore the numbers, they are an example) as a hypothetical case of a label being proposed and implemented. Would they support such a label? I think that if such a labelling scheme was implemented, I think the Right to Know campaign will not only stop, but take a new turn: Fight the Labels. They want labels on their terms, and their terms alone; that is, they want labels to decrease competition against the organic label, not increase it. That label would become what the public thinks of the “Organic certified” label now, and would thus move GMOs into direct competition with organic food. The Right to Know movement thus shows its true colours: it is a political soundbite designed to be superficially pleasing, while being devoid of substance. So, yes, the meme is right, in its own wrong way: we do oppose labelling. However, only the meaningless, counterproductive kind of labelling crafted to serve an ulterior purpose. Furthermore, labelling for the sake of labelling carries an unfounded “danger, danger” connotation precisely because the Decepticons have spent the better part of two decades coordinating campaigns for the hearts and mind of the public at large (actually, more like their amygdalae). Why then, would anybody be surprised that biotech companies funded the “No” campaigns in labelling movements? Would any business willingly allow itself to fall into oblivion, especially in the absence of hard evidence and when public academies of science around the world, the FDA, EPA, USDA, the WHO, Royal Society, and the European Commission have all come to the same conclusion that the currently approved group of GMOs are safe, [^4] human trials are unnecessary (and unethical), and any inherent risks are comparable to or less than other crop modification techniques? The organic industry certainly hasn’t allowed itself to slide into oblivion despite the plethora of evidence showing that conventional and organic produce are more or less nutritionally equivalent, and not worth double the price. At the end of the day, GMOs are not like trans-fats, so no meaningless labels are necessary. Having thus clarified the position, can it be called “deceptive”? Clearly, the answer is no, as it calls for either accurate information or none at all. And, in the absence of accurate information, stands against meaningless or deceptive information. I’m all for labels, so long as they’re done right. - Ronnie Cummins, president of the Organic Consumer's Association. Exploring both banning and labelling, makes the argument that both are necessary. Previous Post Genetically Modified Memes! Next Post STOP EATING NATURAL FOODS!!! Congratulations, my good man! Being singled out is quite the impressive feat! There does exist a lot of hysteria around this subject, but, and I think I’ve said it before, i believe most fears are actually the result of hating Monsanto. I don’t like Monsanto (food should not be patented, nor should fertilisers be part of the up-selling, of which they’re guilty), but I do recognise that without GMO’s we don’t stand a chance of sustaining our already too-large population. Let there be vertical farms, by the thousands! My initial anti-Monsanto fervor has died down significantly. Basically nothing said about the company on the Internet is true. Here’s hoping to more VFs! They are a cool idea. Good post, fellow denier. It’s nice to be associated with the smart kids, no?. Regarding Mercola,it should also be noted that he opposes the Dietary Supplement Labeling Act introduced by Senator Durbin. Mercola says the result of labeling would create financial hardships on supplement selling companies, “granting the FDA more power to regulate supplements as if they were drugs, effectively putting supplement companies out of business.” Ha! Its just a label, right? Now that is not at all hypocritical! I’ve been meaning to do a post on that act. They hate big pharma whom are poisoning the country because of the laissez-faire rules of the FDA, and their solution is to be totally laissez-faire in their industry. Well, I guess logic isn’t one of his strong points. Congratulations ~ you’ve made it to the big time. Keep the information flowing. Note many of these people are for voluntary labeling, which, in reality is no labeling so…. You article explains the meme perfectly, No all of us who want transparency & a mandatory label do not view it as being a scarlet letter or X poison. You’re buying into your own fears about these products by listening too much to food babe & Mercola. This leaves the regular ole citizen, like myself (and majority) without a choice. Transparency will give us that choice (we deserve to know what we are buying with our dollars) and transparency will mend the rifts by building trust. One last point, I read your book & you’re no idiot. I don’t understand how Lynas being pro-federal labelling can then be considered against labelling? Is state-labelling the barometer of progress here? If so, there is another simple reason why it’s a bad idea, but I’ll allow you to clarify this. Also, Julee K endorsed a particular method of labelling, so I don’t think it’s fair to include her on this list (unless she herself has reversed that endorsement). But, if the point of this meme is merely to list as deniers those against a very specific type of labelling, I’m not sure that is productive either. Thanks for letting me know I explained the meme perfectly (its refreshing when many will say you did a disservice without telling you what that disservice was). Perhaps you’re right, that I am extrapolating my own fears into such a label. Mike Bendzela, a previous guest writer on this blog, thinks that if introduced, the label will be ignored. I don’t have such rosy hopes as him, because, even if it does, the anti-GMO groups will be doubly invigorated to pass on the message that the layperson should treat it as a poison. It’s been two decades and they haven’t tired of their ceaselessly falsified claims. Who knows, perhaps the label will encourage them to go another two decades? Lastly, is not the “Organic” label the exact same thing? 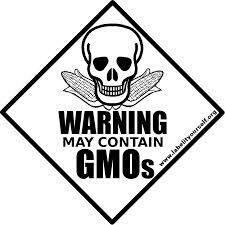 It means GMO-free, it is one of the defining characteristics of that label after the mode of farming. I’d like to ask you then, why does that not suffice? Sorry for typo’s, but, you get my point. Haha, better luck next time, aye 🙂 Great article on your food-ethics blog btw, enjoyed it.